If you are a POLYU-er, you must have seen these videos (理大地庫拍到o野 [膽小勿看], 理大地庫拍到o野 Part 2 [現真身]) which widely spread among the circle recently. Today, we are very pleased to have the two leading characters, Red & Yellow, to have an interview with us. Kitchen: Nice to meet you guys. As usual, you two have caught the attention of the whole town; may I know the motive of making such a brilliant video? Red: … There was not supposed to be a VIDEO! Yellow: We are not?! Oh…. Kitchen: That’s mean you were accidentally caught by the CCTV? But I still can’t see why you two have to sneak into the PolyU campus and tore posters off the wall. Red: Ask yourselves, what have you done to us?! Kitchen: Are you referring to the extremely fun, highly addictive, well-made 12-games-in-1 mobile App created by KITCHEN lately? Red: Yeah, whatever! Now everyone in town is hunting for us on their mobile, days and nights endless hunting! Kitchen: Obviously that didn’t work. The “M&M’S HUNT” App have been the Top 5 free game on the App store within a week, even before the official TV Commercial is launched. There are over 50,000 installations and the number is still increasing. Red: Shut up, Yellow. Can we go now? Seems like even our reporter can’t resist the irresistible M&M’S too! 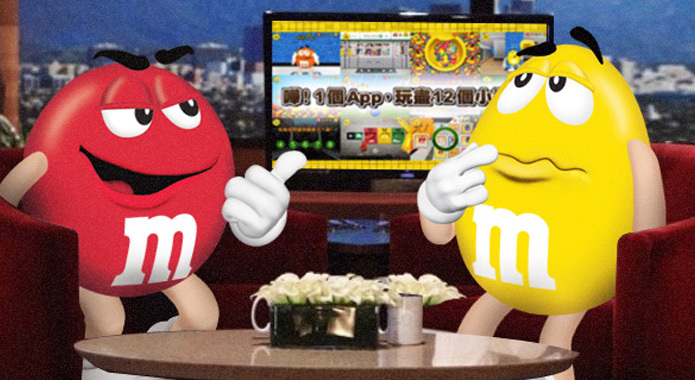 To join the hunt, simply search for “M&M’S HUNT” or “M&M’S 逐個捉” at App Store or Google Play Store now!